A wide range of products are available on the market. 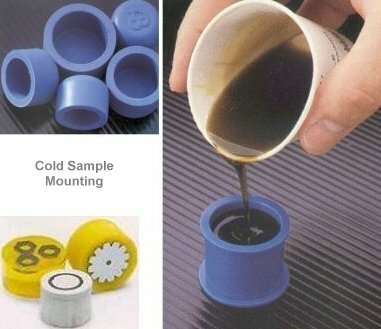 Generally faster setting products including acrylic resin types are less favorable, as these tend to develop low hardness and often suffer from 'shrinkage'. Shrinkage is the term given when the resin shrinks away from the sample surface during curing. This is undesirable as the gap which forms harbors contaminants, grit from grinding and polishing stages to cause cross contamination of polishing surfaces. It is difficult to obtain a good polished, scratch free surface when gaps in the mounting material are present. Epoxy resin types generally have the best characteristics with respect to hardness and shrinkage. However, epoxy resins tend to be slower curing and adequate time should be allowed to ensure that the material is fully cured before proceeding. Epoxies often take a considerable period of time after initial 'setting' to develop full hardness. It is not generally possible to make cold curing resins conductive suitable for SEM examination.